Setting a different background for each monitor in multi-monitor setups should be built into the desktop but, well... Gnome lacks this feature. If you use Gnome, one way of having a different wallpaper for each monitor is to use the HydraPaper application. HydraPaper works even if Nautilus is set to draw the desktop, like in Ubuntu 18.04, so you can have different wallpapers for each monitor, while keeping desktop icons functional (unlike some older solutions that required the desktop icons to be disabled, like Nitrogen). 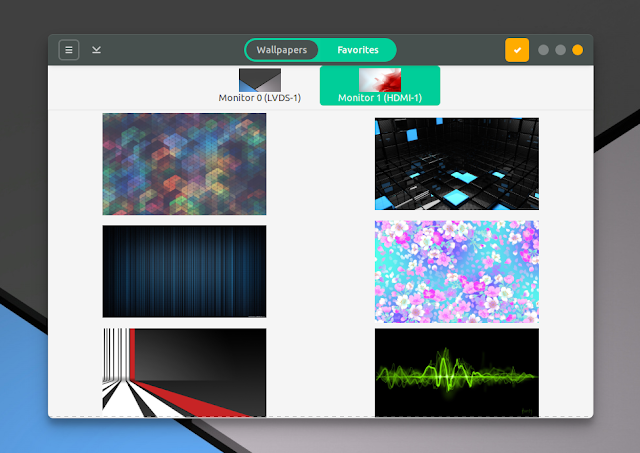 To use HydraPaper to set a different background for each monitor, open the app and select a wallpaper for each monitor, then click the Apply button and you're done. Note that you'll need to select a background of each monitor or else it won't work (you can't leave the wallpaper blank for a monitor). The application adheres to the KISS principle, keeping things very simple, and doesn't offer a great deal of features. The only extra features you'll find are an option for adding multiple background image locations, and the ability to add backgrounds to your favorites, for easy access. If you have monitors that are rotated vertically, or with different screen resolutions, you'll be glad to know that HydraPaper supports this as well, at least according to a closed bug report (I didn't try this myself). Since Gnome doesn't allow setting different wallpapers for each monitor by itself, HydraPaper uses a workaround to achieve this: it merges multiple wallpaper images into a single one and sets it as spanned. Unfortunately I don't think there's another way (or another way other than workarounds like this) to set a different background for each wallpaper in Gnome. If you know of an application that is able to do this directly, without such workarounds, let us know in the comments section below!